When managed properly, manure can be a valuable resource on a farm. Manure can be a source of nutrients for crop production and improved soil quality. The organic matter present in manure can improve both tilth and water holding capacity of the soil. Livestock and poultry manure is a valuable fertilizer for crop and pasture production. Most farm owners do not realize the value of the manure that is produced on their farms. When not managed properly, manure can pollute the environment; mainly as ground or surface water pollution due to the nutrients nitrogen (N), phosphorus (P), and carbon (organic matter). In addition, manure can lead to air quality concerns, pathogens in water supplies, odors, dust, and the presence of vermin. Manure nutrients can be very beneficial for the soil and plant growth; however, application rates should be based on plant growth needs. Excessive manure application to the soil can result in nutrient leaching and increased losses through runoff. In addition, manure could contain soluble salts and other minerals such as arsenic, copper, and zinc, which in excessive amounts may negatively impact the soil and water quality. Manure nutrients, (N, P, and organic matter) can be major pollutants in lakes and estuaries as well as rivers. Nitrogen and phosphorus attached to soil erosion particles may reach waterways through surface runoff or wind deposition. Dissolved N and P may leach through the soil, ultimately reaching water bodies or wells. Organic matter can enter water bodies in the form of manure, vegetative matter, or animal carcasses. Waters rich in minerals and organic nutrients promote a proliferation of plant life, especially algae. This process is called eutrophication. Algae growth and the decomposition of organic matter in water bodies reduces the dissolved oxygen content of the water, which may lead to fish kills, odors and other negative impacts on the aquatic ecosystem. In addition to the concerns regarding nutrients, pathogens may be present in manure. Some examples of the pathogens are E. coli, Salmonella, and Cryptosporidium parvum. These pathogens can pose human health risks when manure or contaminated water comes in contact with food sources. Flies and rodents are other manure related concerns on livestock farms. These can be minimized by proper design of animal housing and manure storage, and proper handling procedures when turning or moving manure piles. Air quality concerns arise from odors, particulate matter, and aerial pathogens. Ammonia released from manure can produce odors and may react with other compounds in the atmosphere to produce fine particulate matter, which can cause environmental as well as human health (respiratory) effects. There are a variety of other compounds released from manure such as hydrogen sulfide, greenhouse gases (methane and nitrous oxide), volatile organic compounds and dust that may be of concern. Why Implement Nutrient Management Planning? 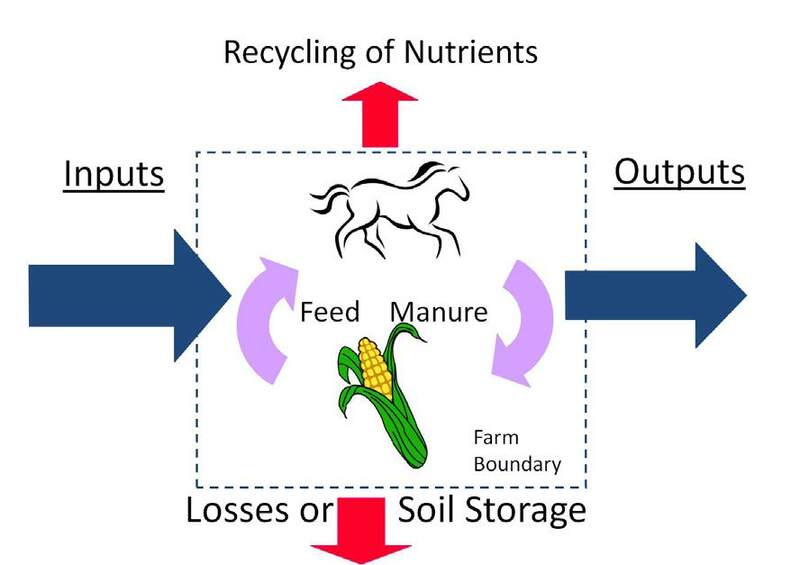 The purpose of nutrient management is to implement practices that permit the efficient use of manure for crop production while preventing potential environmental impacts caused by nutrient losses. Nutrient management planning is a site specific exercise; and, if the recommendations are followed, nutrient losses will be minimized. Factors typically considered in nutrient management planning are: goals of the farming operation as well as any constraints; available farm resources (land, equipment, financial resources); potential critical areas on the farm (sensitive water bodies, neighbor concerns, erosion, manure storage); and nutrient balance analysis (shown in the figure below). Farm nutrient inputs consist of animals, feed, fertilizer, legume nitrogen, and bedding. Outputs are animals, milk, meat, eggs, manure, and crops. Recycling also occurs on the farm with nutrients moving from feed through livestock, applied to soil, utilized by plants, and back to feed again. The optimal goal of whole farm nutrient balance is for the farm to remain in balance between inputs and outputs while minimizing losses as runoff or leachate from either the soil or manure. Soil can store some nutrients assuming that the amount of manure applied to the soil is not excessive. The challenges of managing manure nutrients are different on a small farm than on many larger farms although the principles are similar. Small farms have fewer animals and sometimes several animal species on the same farm. They also may have limited acreage and/or lack equipment for spreading manure. A basic nutrient management program for any farm size will provide information on feeding animals and managing their diets; manure production; basic soil science and soil fertility, crop and pasture production; and nutrient (manure) management. A tractor and a manure spreader are needed to ensure proper field application of stored manure. Some small farms may be able to utilize small ground-driven spreaders that can be pulled behind an all-terrain vehicle or pickup instead of a tractor. Pull-type spreaders are traditionally used, although truck-mounted spreaders are sometimes used on larger farms. Solid manure can be removed from storage using front-end loaders, scrapers, or other handling equipment. Small or limited-resource farms can get by with equipment as simple as a wheelbarrow and pitch fork. The size of the equipment influences the time required to load, haul, and spread manure. Manure should not be spread where and when there is any risk for water pollution, such as near streams, ponds, wells or other waterbodies. Your local soil and water conservation district or Natural Resources Conservation Service (nj.nrcs.usda.gov) office can also help identify if additional special protection areas exist on farmland and bordering properties. Stored manure should be applied to the soil in a thin layer to speed drying and discourage fly breeding. Spreading incompletely composted manure on horse pastures should be avoided due to the risk of infecting pastures with internal parasites. Manure should be spread at agronomic rates (rates equal to or less than plants will use in a year). When stockpiled manure is spread on crop fields, the application may not meet the total needs of the crop. Each source of horse manure will vary, especially when different bedding sources are used. Typically, a ton of horse manure will contain 11 pounds of nitrogen, 4.5 pounds of phospohat (phosphorous), and nine pounds of potash (potassium). Average values are given in the table below and can help to determine the number of acres needed to properly apply the horse manure. Refer to your local Cooperative Extension office to get a list of laboratories that will do manure analysis. When Should Manure be Land Applied? Spring is the preferred time to apply manure. Forage or hay crops generally provide the greatest flexibility in planning land application operations. Cool season grasses can generally utilize manure nutrients from early spring to late fall, and application equipment generally does not adversely affect the crop regardless of its growth stage. However, spreading manure on wet soils should be discouraged as it leads to soil compaction and destruction of the top soil. Spreading manure on frozen ground in the winter should always be avoided, especially if there are water runoff risks. When spread, not all nutrients in manure are immediately available for plant use. The amount of nitrogen available is a function of the percentage of nitrogen in the manure, whether or not it is incorporated in the soil, and the rate of organic matter decomposition of the manure. Nitrogen availability (during the first growing season) will range from 20% of the total nitrogen when manure is spread on the soil surface to 60% when immediately incorporated into the soil. Availabilities of phosphorus from phosphate (P2O5) and potassium from potash (K2O) are commonly set at 80% and 90% of totals, respectively. Horse manure often has an additional consideration when it comes to nutrient availability. Sawdust or wood shavings are high-carbon materials that require a great deal of nitrogen to break down. This process can tie up available nitrogen, rendering it unavailable to plants or crops. In situations where land application is not an option or the farm has more manure than can be appropriately utilized, the producer will need to consider off-farm manure disposal. Farmers may also sell or give their manure away, composted or noncomposted, for off-farm use. Gardeners are frequently willing to take (or even buy) composted horse manure. Crop farmers may be willing to let you spread manure on their land during certain times of year. Determine the quantity of manure available for spreading and its nutrient content. Determine the quantity of manure that will be disposed off-farm. Determine where remaining manure will be spread. Determine what crops will be grown and what are the nutrient requirements of those crops. Evaluate environmental risks, slopes, topography, distance to water, etc. Develop a fertilization plan using nutrients from manure and commercial sources. Calculate balance and soil nutrient inventories.